According to a Gartner report from December 2012, “85 percent of all flat-panel TVs will be Internet-connected Smart TVs by 2016.” Forbes magazine gives some analysis about what is fueling this trend: http://www.forbes.com/sites/michaelwolf/2013/02/25/3-reasons-87-million-smart-tvs-will-be-sold-in-2013/ , The article makes a mention of “DIAL”, an enabling technology for second-screen features (which this post is about). With these new devices come new risks as evidenced in the following article: https://securityledger.com/2012/12/security-hole-in-samsung-smart-tvs-could-allow-remote-spying/ , as well as more recent research about Smart TV risks presented at the CanSecWest and DefCon security conference this year (2013). For more details about about exactly what features a Smart TV has above and beyond a normal television, consult this WikiPedia article: http://en.wikipedia.org/wiki/Smart_TV. This post introduces and describes aspects of “DIAL”, a protocol developed by Google and Netflix for controlling Smart TVs with smart phones and tablets. DIAL provides “second screen” features, which allow users to watch videos and other content on a TV using a smart phone or tablet. This article will review sample code for network discovery and enumerate Smart TV apps using this protocol. Smart TVs are similar to other modern devices in that they have apps. Smart TVs normally ship with an app for YouTube(tm), Netflix(tm), as well as many other built-in apps. If you have a smartphone, then maybe you’ve noticed that when your smartphone and TV are on the same network, a small square icon appears in some mobile apps, allowing you to play videos on the big TV. 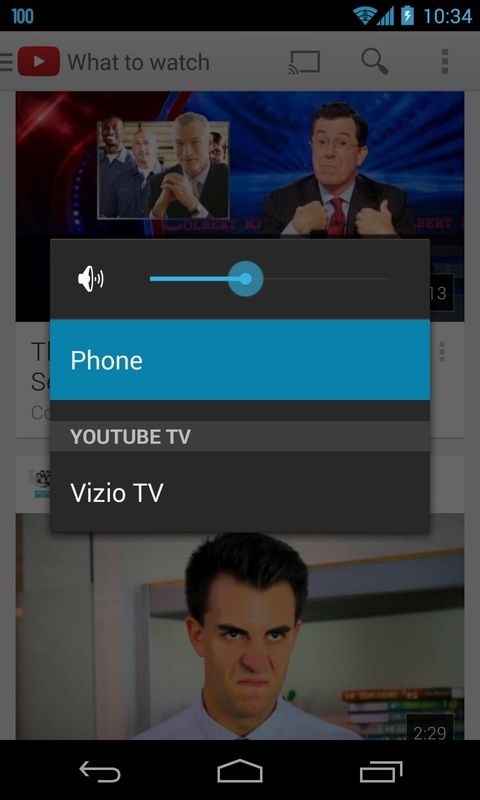 This allows you to control the TV apps from your smartphone. Using this setup, the TV is a “first screen” device, and the phone or tablet functions as a “second screen”, controlling the first screen. DIAL is the network protocol used for these features and is a standard developed jointly between Google and Netflix. (See http://www.dial-multiscreen.org/ ). DIAL stands for “Discovery and Launch”. This sounds vaguely similar to other network protocols, namely “RPC” (remote procedure call). Basically, DIAL gives devices a way to quickly locate specified networked devices (TVs) and controlling programs (apps) on those devices. Square appears when YouTube app finds TVs on the network. Let’s examine the traffic generated by the YouTube mobile app at launch. 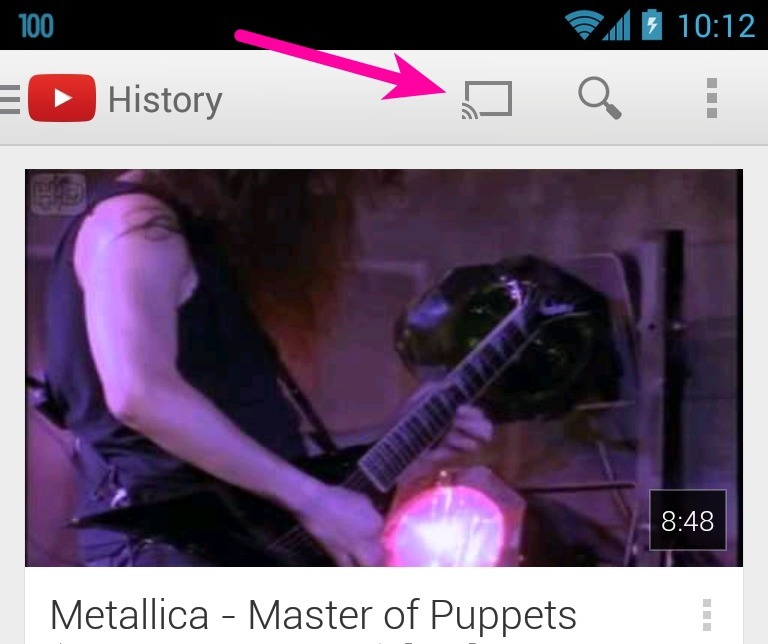 The Youtube mobile app send an initial SSDP request, to discover available first-screen devices on the network. The sent packet is destined for a multicast address (239.255.255.250) on UDP port 1900. Multicast is useful because devices on the local subnet can listen for it, even though it is not specifically sent to them. The YouTube app multicast packet contains the string “urn:dial-multiscreen-org:service:dial:1”. A Smart TV will respond to this request, telling YouTube mobile app its network address and information about how to access it. Notice that the TV returns a LOCATION header, with a URL: http://192.168.1.222:44047/dd.xml . The response from reading that URL leads to yet another URL which provides the “apps” link on the TV. Two listening web services on random high ports. A RESTful control interface to the TV’s YouTube application. Hopefully this article has been informative for those who may be looking for new devices and attack surfaces to investigate during application or penetration testing. Whether you are a seasoned, international road warrior, or a domestic suburbanite, new security features will soon be showing up on a credit card near you. In light of recent card data compromises, there’s a new drive to adopt credit card security technologies known as “Chip and PIN” (typically noted as “chip/PIN”) to better secure credit card data against fraud or compromise. While chip/PIN is new to most U.S. cardholders, it is the norm across most of Europe, Canada, and Mexico. There have been many initiatives in the last several years to drive U.S. payment card systems towards more secure technologies, but only now is adoption of chip/PIN starting to get increased traction across the U.S. payment card industry. For individual card holders, these developments are important, and in this post we will cover some of the key points of these technologies. First, what exactly is chip/PIN and what does it do to protect credit card data? In a chip/PIN environment, when purchasing goods at a point of sale (POS) device, the credit card is inserted or “dipped” into a card reading device—not swiped as it is in the U.S. Once inserted, the customer inputs a PIN which authenticates the cardholder against the chip embedded on the card. Upon successful authentication, the chip generates the data necessary to complete the transaction and transmits the data for authorization. Before we get too far into the discussion about chip/PIN, there is one point that needs to be clarified: The chip component of chip/PIN cards is sometimes referred to as “EMV data” or “EMV transactions” in the payment industry. The term EMV (for Europay, MasterCard and Visa) refers to a standard definition for chip-based payment cards, or “chip cards”—also referred to as “IC (integrated circuit) cards” as defined by EMVCo LLC. EMV is the basis for the chip/PIN implementation throughout Europe, and is planned for implementation in the U.S. (more on that, below). In short, EMV refers to the “chip” portion of chip/PIN cards, with the “PIN” implementation being a separate matter entirely. What’s the difference between chip/PIN and chip/signature? Track-equivalent data is the data — including cryptographic data — used for transaction authentication and authorization within EMV environments. It is generated by the on-board integrated circuit, or the “chip,” on the card itself—not the card-reading device. This is not to say that track-equivalent data is “secure” in-and-of-itself. Because of some of the underlying functional requirements, track-equivalent data typically includes certain discretionary data elements, some of which are sensitive in nature and cannot be stored (something merchants should note). From the cardholder perspective, however, there is one notable difference and that is the requirement of a PIN or signature to verify that the person holding the card is the actual card owner. Is chip/PIN more or less secure than chip/signature? In a chip/PIN scenario, the PIN is used to authenticate the cardholder against the information stored on the chip. If you don’t know the PIN, the chip won’t give up the information necessary to complete the transaction. In a chip/signature scenario (theoretically speaking), the clerk responsible for completing the transaction would be required to validate the customer signature on the receipt with their signature on the card. If your signature doesn’t match sufficiently enough per the clerk’s perusal, they won’t complete the transaction. Say what you will about how consistently the practice of signature verification is actually practiced, versus how it is supposed to in theory, there are equally compelling arguments for either approach. In a chip/PIN environment, as long as the cardholder’s PIN is kept secret, it would be theoretically impossible for someone to use a stolen card to perform fraudulent card-present transactions. It is because of the PIN requirement that card criminals have evolved their data collection strategies to include video surveillance targeting PIN entry devices, such as at ATMs and retail point-of-sale devices, to collect customer PINs. Once the PIN is compromised, the card can be used for fraudulent transactions. On the other hand, I can show my signature around to anyone, put it on all my receipts, etc., and the likelihood of anyone being able to reliably reproduce it on demand is pretty slim (expert forgers, excluded). Ultimately, the question boils down to this: Which is a more secure means to verify that a credit card belongs to the person holding the card? It can be erroneously concluded that U.S. implementation of EMV heading in the direction of chip/signature undermines many of the anti-fraud security protections of chip/PIN. However, when the issue is considered from multiple sides, especially in putting everything together for this article, the more it is clear that there is no significant security benefit of one solution over the other. Whether it is PIN or signature, the control is only used to authenticate the cardholder—the rest is about implementing security controls via EMV and integrated circuit cards that has nothing to do with either PINs or signatures. Until there is historical data to demonstrate the effectiveness or ineffectiveness of signatures vs. PINs in reducing card fraud, the jury is still out on which solution offers a significant upside over alternatives. Ultimately, whether cards are authenticated via PIN or signature, the chip-based credit cards being rolled out in the U.S. will rely upon EMV security measures to protect the security of credit card data. These technologies provide a solid foundation for improving the overall security of credit card information and limiting fraud and misuse of compromised credit card data. Farewell, Windows XP! We hated you, then loved you, and soon we’ll hate you again. For those who haven’t seen it in the news yet: Microsoft will be ending support for its hugely successful operating system, Windows XP, on April 8th. This means that users of the 12-year-old operating system will no longer be able to get updates, and in particular will not be able to get security updates. Users of more modern versions of Windows, such as Windows Vista or Windows 7 will remain supported for several more years. 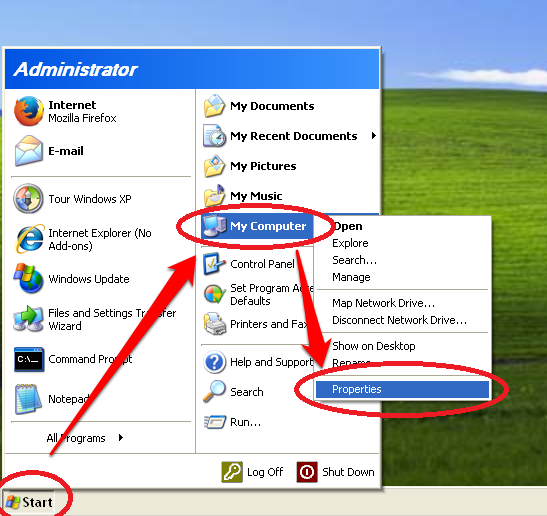 Once support ends, computers still on Windows XP will become a very juicy target for Internet criminals and attackers. Internet crime is big business, so every day there are criminals looking for new weaknesses in computer systems (called vulnerabilities), and developing attacks to take advantage of them (these attacks are called exploits). Normally, the software vendor (Microsoft in this case) quickly finds out about these weaknesses and releases updates to fix them. When an exploit is developed, some number of people fall victim shortly after the exploit is first used, but people who get the update in a relatively timely manner are protected. But what happens when a vendor stops updating the software? All of a sudden, the bad guys can use these same attacks, the same exploits, indefinitely. As a product nears end of life, attackers have an incentive to hold off on using critical vulnerabilities until the deadline passes. The value of their exploits goes up significantly once they have confidence that the vendor will never patch it. Based on that, we can expect a period of relative quiet in terms of announced vulnerabilities affecting XP from now until shortly after the deadline, when we will likely see stockpiled critical vulnerabilities begin circulating. From then on, the risk of these legacy XP systems will continue to increase, so migrating away from XP or dramatically isolating the systems should be a priority for people or organizations that still use them. 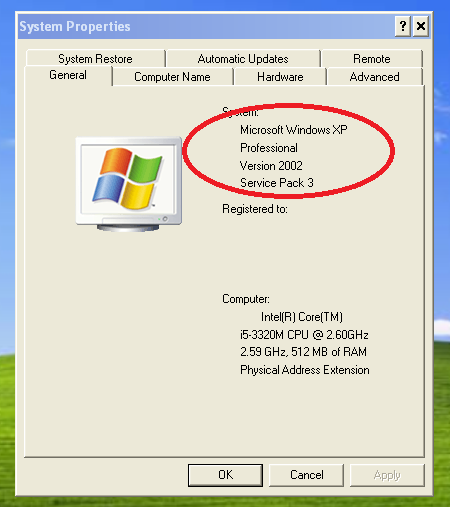 How do I know if I’m running Windows XP? Simplest way: “Win+Break”: Press and hold down the Windows key on your keyboard, then find the “Pause” or “Break” key and press it. Let both keys go. That will show the System Properties windows. You may have to hunt around for your “Pause/Break” key, but hey, it finally has a use. Click the Start Menu, then right-click My Computer, then click Properties. Your version of Windows will be the first thing on the System Properties window. Really, you should think about buying a new computer. You can think of it as a once a decade spring cleaning. If your computer is old enough to have Windows XP, having an unsupported OS is likely just one of several problems. It is possible to upgrade your old computer to a newer operating system such as Windows 7, or convert to a free Linux-based operating system, but this may be a more complicated undertaking than many users want to tackle. Any computer you buy these days will be a huge step up from a 7-year old (at least!) machine running XP, so you can comfortably shop the cheapest lines of computers. New computers can be found for $300, and it’s also possible to buy reputable refurbished ones with a modern operating system for $100-$200. For those who really don’t want to or can’t upgrade, the situation isn’t pretty. Your computer will continue to work as it always has, but the security of your system and your data is entirely in your hands. These systems have been low-hanging fruit for attackers for a long time, but after April 8th they will have a giant neon bull’s-eye on them. There are a few things you can do to reduce your risks, but there really is no substitute for timely vendor patches. Only use the system for tasks that can’t be done elsewhere. If the reason for keeping an XP machine is to run some specific program or piece of hardware, then use it only for that. In particular, avoid web browsing and email on the unsupported machine: both activities expose the vulnerable system to lots of untrusted input. Keep all of your other software up to date. Install and use the latest version of Firefox or Chrome web browsers, which won’t be affected by Microsoft’s end of life. Back up your computer. There are many online backup services available for less than $5 a month. If something goes wrong, you want to make sure that your data is safe. Good online backup services provide a “set it and forget it” peace of mind. This is probably the single most important thing you can do, and should be a priority even for folks using a supported operating system. Backblaze, CrashPlan, and SpiderOak are all reasonable choices for home users. Run antivirus software, and keep it up to date. AVAST, AVG, and Bitdefender are all reasonable free options but be aware that antivirus is only a layer of protection: it’s not perfect. Only a few details have emerged about the recent breach at Kickstarter, but it appears that this one will be a case study in doing things right both before and after the breach. The hours and days after a breach is discovered are incredibly hectic, and there will be powerful voices both attempting to delay public announcement and attempting to rush it. When users’ information may be at risk beyond the immediate breach, organizations should strive to make an announcement as soon as it will do more good than harm. An initial public announcement doesn’t have to have all the answers, it just needs to be able to give users an idea of how they are affected, and what they can do about it. While it may be tempting to wait for full details, an organization that shows transparency in the early stages of a developing story is going to have more credibility as it goes on. Kickstarter explained in clear terms what was and was not affected, and gave straightforward actions for users to follow as a result. The logging and access control groundwork for making these strong, clear statements at the time of a breach needs to be laid far in advance and thoroughly tested. Live penetration testing exercises with detailed post mortems can help companies decide if their systems will be able to capture this critical data. One of the first questions in any breach is “what did they get?”, and data handling policies in place before a breach are going to have a huge impact on the answer. Thinking far in advance about how we would like to be able to answer that question can be a driver for getting those policies in place. Kickstarter reported that they do not store full credit card numbers, a choice that is certainly saving them some headaches right now. Not all businesses have quite that luxury, but thinking in general about how to reduce the retention of sensitive data that’s not actively used can reduce costs in protecting it and chances of exposure over the long term. Kickstarter appears to have done a pretty good job in handling user passwords, though not perfect. Password reuse across different websites continues to be one of the most significant threats to users, and a breach like this can often lead to ripple effects against users if attackers are able to obtain account passwords. In order to protect against this, user passwords should always be stored in a hashed form, a representation that allows a server to verify that a correct password has been provided without ever actually storing the plaintext password. Kickstarter reported that their “passwords were uniquely salted and digested with SHA-1 multiple times. More recent passwords are hashed with bcrypt.” When reading breach reports, the level of detail shared by the organization is often telling and these details show that Kickstarter did their homework beforehand. A strong password hashing scheme must protect against the two main approaches that attackers can use: hash cracking, and rainbow tables. The details of these approaches have been well-covered elsewhere, so we can focus on what Kickstarter used to make their users’ hashes more resistant to these attacks. To resist hash cracking, defenders want to massively increase the amount of work an attacker has to do to check each possible password. The problem with hash algorithms like SHA1 and MD5 is that they are too efficient; they were designed to be completed in as few CPU cycles as possible. We want the opposite from a password hash function, so that it is reasonable to check a few possible passwords in normal use but computationally ridiculous to try out large numbers of possible passwords during cracking. Kickstarter indicated that they used “multiple” iterations of the SHA1 hash, which multiplies the attacker effort required for each guess (so 5 iterations of hashing means 5 times more effort). Ideally we like to see a hashing attempt take at least 100 ms, which is a trivial delay during a legitimate login but makes large scale hash cracking essentially infeasible. Unfortunately, SHA1 is so efficient that it would take more than 100,000 iterations to raise the effort to that level. While Kickstarter probably didn’t get to that level (it’s safe to assume they would have said so if they did), their use of multiple iterations of SHA1 is an improvement over many practices we see. To resist rainbow tables, it is important to use a long, random, unique salt for each password. Salting passwords removes the ability of attackers to simply look up hashes in a precomputed rainbow tables. Using a random, unique salt on each password also means that an attacker has to perform cracking on each password individually; even if two users have an identical password, it would be impossible to tell from the hashes. There’s no word yet on the length of the salt, but Kickstarter appears to have gotten the random and unique parts right. Finally, Kickstarter’s move to bcrypt for more recent passwords is particularly encouraging. Bcrypt is a modern key derivation function specifically designed for storing password representations. It builds in the idea of strong unique salts and a scalable work factor, so that defenders can easily dial up the amount computation required to try out a hash as computers get faster. Bcrypt and similar functions such as PBKDF2 and the newer scrypt (which adds memory requirements) are purpose built make it easy to get password handling right; they should be the go-to approach for all new development, and a high-priority change for any codebases still using MD5 or SHA1. NTP, network time protocol, is a time synchronization protocol that is implemented on a network protocol called UDP. UDP is designed for speed at the cost of simplicity, which plays into the inherent time-sensitivity (or specifically, jitter sensitivity) of NTP. Time is an interesting scenario in computer security. Time isn’t exactly secret; it has relatively minor confidentiality considerations, but in certain uses it’s exceedingly important that multiple parties agree on the time. Engineering, space technology, financial transactions and such. When you get to a ratio > 1, a protocol like NTP becomes attractive as a magnifier for denial of service traffic. UDP’s simplicity makes it susceptible to spoofing. An NTP server can’t always decide whether a request is spoofed or not; it’s up to the network to decide in many cases. For a long time, operating system designers, system implementers, and ISPs did not pay a lot of attention to managing or preventing spoofed traffic. It was and is up to millions of internet participants to harden their networking configuration to limit the potential for denial of service amplification. Economically there’s frequently little incentive to do so – most denial of service attacks target someone else, and the impact to being involved as a drone is relatively minor. As a result you get systemic susceptibility. My advice is for enterprises and individuals to research and implement network hardening techniques on the systems and networks they own. This often means tweaking system settings, or in certain cases may require tinkering with routers and switches. Product specific hardening guides can be found online at reputable sites. As with all technology, the devil is in the details and effective management is important in getting it right. In the news lately there have been countless examples of phishing attacks becoming more sophisticated, but it’s important to remember that entire “industry” is a bell curve: the most dedicated attackers are upping their game, but advancements in tooling and automation are also letting many less sophisticated players get started even more easily. Put another way, spamming and phishing are coexisting happily as both massive multinational business organizations and smaller cottage-industry efforts. One such enterprising but misguided individual made the mistake of sending a typically blatant phishing email to one of our Neohapsis mailing lists, and someone forwarded it along to me for a laugh. As silly and evident as this is, one thing I’m constantly astounded by is how the proportion of people who will click never quite drops to zero. Our work on social engineering assessments bears out this real world example: with a large enough sample set, you’ll always hook at least one. In fact, a paper out of Microsoft Research suggests that, for scammers, this sort of painfully blatant opening is actually an intentional tool: it acts as a filter that only the most gullible will pass. Given the weak effort put into the email, I was curious to see if the scam got any better if someone actually clicked through. To be honest, I was pleasantly surprised. 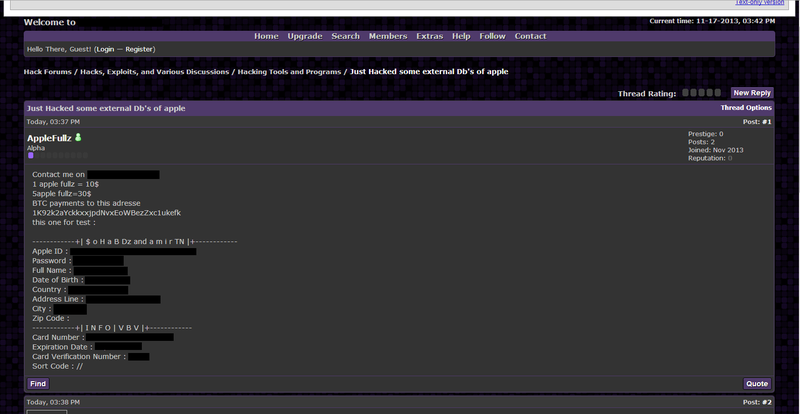 The site is dressed up as a reasonable approximation of an official Apple site. In fact, a look at the source shows that there are two things going on here: some HTML/CSS set dressing and template code that is copied directly from the legitimate Apple site, and the phishing form itself which is a reusable template form created by one of the phishers. Naturally, I was curious where data went once the form was submitted. I filled in some bogus data and submitted it (the phishing form helpfully pointed out any missing data; there is certainly an audacity in being asked to check the format of the credit card number that’s about to be stolen). 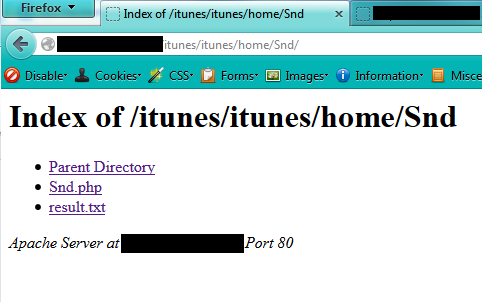 The data POST went back to another page on the same server, then quickly forwarded me on to the legitimate iTunes site. This is another standard technique: if a “login” appears to work because the victim was already logged in, the victim will often simply proceed with what they were doing without questioning why the login was prompted in the first place. During social engineering exercises at Neohapsis, we have seen participants repeatedly log into a cloned attack site, with mounting frustration, as they wonder why the legitimate site isn’t showing them the bait they logged in for. Back to this phishing site: my application security tester spider senses were tingling, so I felt that I had to see what our phisher was doing with the data being submitted. To find out, I replayed the submit request with various types of invalid data, strings that should cause errors depending on how the data was being parsed or stored. Not a single test string produced any errors or different behavior. This could be an indication that any parsing and processing is being done carefully and correctly, but the far more likely case is that they’re simply doing no processing and dumping it all straight out as plain text. Interesting… if harvested data is just being simply dumped to disk, where exactly is it going? Burp indicates that the data is being POSTed to a harvester script at Snd/Snd.php. I wonder what else is in that directory? That results.txt file looks mighty promising… and it is. These are the raw results dumped from victims by the harvester script (Snd.php). The top entry is dummy data that I submitted, and when I checked it, the file was entirely filled with the various dummy submissions I had done before. It’s pretty clear from the results that I was the first person to actually click through and submit data to the phish site; actually pretty fortunate, because if a victim did enter legitimate information, the attacker would have to sort it out from a few hundred bogus submissions. Any day that we can make life harder for the the bad guys is a good day. Googling some variations turned up Google cache of a forum post that’s definitely related to the phishing site above; it’s either the same guy, or someone else using the same tool. 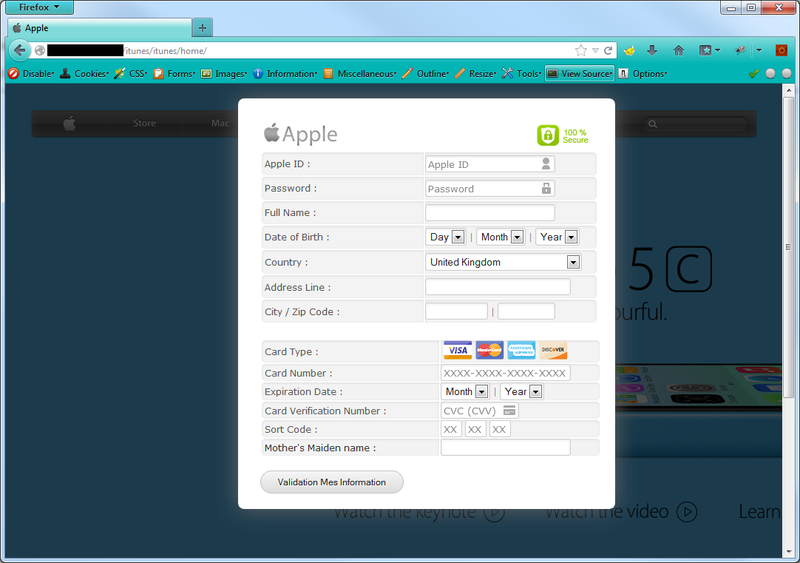 A criminal using the name AppleFullz is selling complete information dumps of login details and credit card numbers plus CVV numbers (called “fulls” in carder forums) captured in the exact format that the Apple phish used, and even provides a sample of his wares (Insult to injury for the victim: not only was his information stolen, but it’s being given away as the credit card fraud equivalent of the taster trays at the grocery store). This carder is asking for $10 for one person’s information, but is willing to give bulk discounts: $30 for 5 accounts (This is actually a discount over the sorts of prices normally seen on carder forums; Krebs recently reported that Target cards were selling for $20-$100 per card. I read this as an implicit acknowledgement by our seller that this data is much “dirtier” and that the seller is expecting buyers to mine it for legitimate data). The tools being used here are a combination of some pre-existing scraps of PHP code widely used in other spam and scam campaigns (the section labeled “|INFO|VBV|”), and a separate section added specifically to target Apple ID’s. Of particular interest is that the carder provided a Bitcoin address. For criminals, Bitcoin has the advantage of anonymity but the disadvantage that transactions are public. This means that we can actually look up how much money has flowed into that particular Bitcoin address. Ill-gotten gains: the Bitcoin blockchain records transfers into the account used for selling stolen Apple Id’s and credit card numbers. 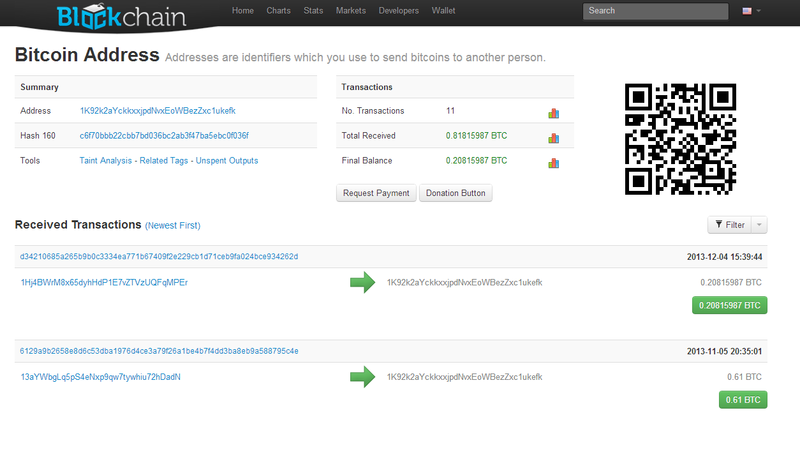 From November 17, when the forum posting went up, until December 4th, when I investigated this phishing attempt, he has received Bitcoin transfers totaling 0.81815987 BTC, which is around $744.53 (based on the BTC value on 12/4). According to his price sheet, that translates to a sale of between 74 and 124 records: not bad for a month of terribly unsophisticated phishing. Within a few hours of investigating the initial phishing site, it had been removed. The actual server where the phish site was hosted was a legitimate domain that had been compromised; perhaps the phisher noticed the volume of bogus traffic and decided that the jig was up for that particular phish, or the system administrator got tipped off by the unusual traffic and investigated. Either way the phish site is offline, so that’s another small victory. No surprise here – it seems to be on the top of every list of this kind, but people still don’t listen. Passwords are still (and will continue to be) the weakest form of authentication. In a perfect security utopia passwords would not exist, but since we’re not there (yet) everyone relies on them. The two main rules on passwords are: make them complex, and make them unique. Complex doesn’t necessarily mean you need thirty random character monstrosities that only a savant could remember, but avoid dictionary words and don’t think that you’re safe by just appending numbers or special characters. The first thing an attacker will do is take every English word in the dictionary and append random characters to the end of it. Yep, “password1989!” is just as (in)secure as “password”. Lastly, passwords should be unique to each site. This is an even bigger sin that most people (myself included) are guilty of. We have one good password so we use it for everything. The problem with this is obvious: if it gets compromised an attacker has access to everything. When LinkedIn’s passwords were compromised last year I realized I was using the same password for all my social media accounts, leaving all those vulnerable too. You don’t need to make an attacker’s job easier for him or her by reusing passwords. Make them work for each one they need to crack. Hopefully, you’ve followed the first rule and have unique, complex passwords for every site you visit. Now, how to remember them all? This is where I love to recommend password managers. Password managers securely store all your log in information in an easily accessible location. I emphasize “securely” here, because I see far too many people with word documents called “My Passwords” or the like sitting on their desktops. This is a goldmine for any attacker who has access to it. I’ve even seen theses “password” files being shared unencrypted in the cloud, so people can pull them up on their phones or tablets to remember their passwords on-the-go. Please don’t do this. Now if you lose your phone you also lose every password to every secure site you have. Instead, use a password manager like 1Password, LastPass, or KeepPass to name a few popular ones. These encrypt and store your sensitive information (not just passwords, but also SSNs, CC numbers, etc..) in an easy to access format. You encrypt your “wallet” of passwords with one very secure password (the only one you ever need to remember), and can even additionally encrypt them with a private key. A private key works just like a physical key – you need a copy of it to access the file. Keep it on a USB stick on your keychain and a backup in a fire-proof safe. Ever notice how some sites start with https:// as opposed to http:// ? That little ‘s’ at the end makes a whole world of difference. When it’s present it means that you have established a trusted and encrypted connection with the website. Its security purpose is two-fold: all data between you and the site is encrypted and cannot be eavesdropped, and you have established through a chain of trust that the website you are visiting is, in fact, who they say they are. It means that the browser cannot verify the website is actually who it says it is. Phishing sites can imitate legitimate logins down to the smallest detail, but they cannot imitate their SSL certificate. If you see this type of warning when trying to access a well-known site, get out immediately! There could be legitimate problem with the website or your browser, but more likely somebody is impersonating them and trying to fool you! Microsoft actually does an excellent job of patching vulnerabilities when they arise; the problem is most people don’t install them. Every other Tuesday new patches and updates are released to the public. Microsoft will also release patches out-of-bounds (OOB), meaning as needed and not waiting for the next Tuesday, for serious vulnerabilities. These patches are a great way to fix security holes but also offer a nasty catch. Attackers use these patches to see where the holes were. Every “Patch Tuesday” attackers will reverse engineer the Windows updates to discover new vulnerabilities and then attempt to target machines that have not applied the update yet. It’s akin to a car manufacturer releasing a statement saying “this year and model car can be unlocked with a toothpick, so apply this fix.” Now every car thief in the world knows to look out for that year and model, and if the fix hasn’t been applied they know to try a toothpick. This is why it’s imperative to keep your computer up to date. The “Conficker” worm that ran rampant in 2009 exploited a security vulnerability that was patched by Microsoft almost immediately. Part of the reason it spread so successfully was people’s reluctance to install new Windows updates. It preyed on out-of-date systems. Likewise, many online exploits will use common vulnerabilities found in different software, like Flash, Java, or even the browsers. When software that you use online prompts you to install an update – do it! So the next time your computer asks you to restart to install updates, go grab a cup of coffee and let it do its thing. It’ll save you in the long run. My last tip is more of a paradigm shift than a tip for when you are conducting business online. It’s okay to be a little paranoid. The old mantra “if it’s too good to be true, it probably is” has never been more applicable when it comes to common phishing schemes. I’m sure most people know by now to not trust a pop-up that says “You’ve won an iPad – click here!”, but modern phishing techniques are much more subtle – and much more dangerous. One of the only times I’ve ever fallen victim to a phishing scheme was when “Paypal” emailed me asking me to confirm a large purchase because it was suspicious. Since I didn’t make the order I immediately thought I had been compromised. I went into panic mode, clicked the link, entered my password….and, wait, I just entered my Paypal password into a site I don’t even recognize. They got me. It’s okay to mistrust emails and links. If something seems phishy (pun intended) then exit out. Services like Paypal and online banks will never ask for personal information over email, chat, or any avenue besides their main website. If you have an issue, go to their website, ensure that ‘s’ is in your address bar, and do your business from there. If you’re still not convinced, find their 800 number and call them. The point is, if I had stayed calm for a second and thought it was strange Paypal was asking me to urgently log in via an email message, I would have gathered myself, gone to their official site to log in and then looked for any alerts or suspicious activity. I could have even called them. Trying not to sound too misanthropic here, but when it comes to dealing with sensitive information online it’s better to not trust someone initially then it is to trust them implicitly. Your bank account information won’t be deleted and nothing bad will happen if you don’t immediately update your password, so take a second to make sure what you’re doing is actually legit.